Polka dots and cheetah print please stepped aside to make way for these fun and funky prints. If you’re looking to update your wardrobe with an easy go to blouse, skirt or dress for work, family functions, or a brunch date we suggest trying an alternative print as seen above. If you are initially intimidated by these prints, the key to pulling off this look is dress up the alternative prints with neutral pieces. 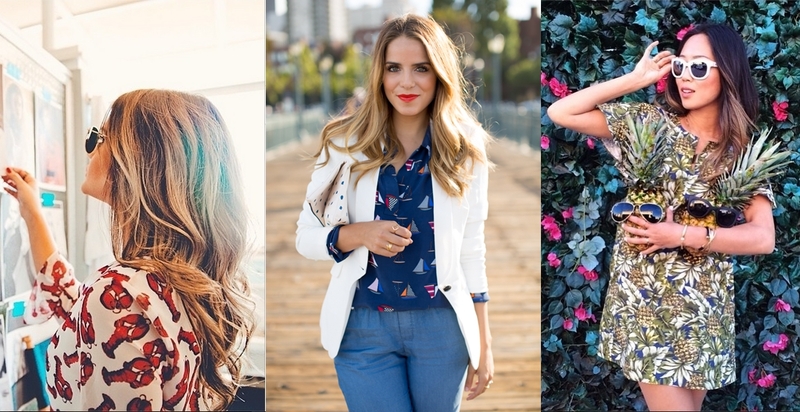 Take note of Julia Hegel of Gal Meets Glam, in the middle photo, as she pairs a cute sail boat print with a crisp white blazer and blue trousers. Brazilian fashion blogger Thassia Naves is not afraid of prints, she has been mixing, matching and experimenting for months. Aimee Song of Song of Style goes the extra mile to get a look a like for her pineapple printed dress.